Formulated with an active, multi-mineral, chrono energizing blend of Zinc, Copper and Magnesium. This mineral rich mask works synergistically to improve your skin's vitality and also aid as a booster for active ingredients. These triple action, anti-free radical agents aid in improving skin texture as well as offering a shield against oxidative stress and pollution. Hydra-M Advanced Mineral Face Mask Formulated with Hydra-M a multi-mineral, chrono energizing blend of Zinc, Copper and Magnesium. This mineral rich mask works synergistically to improve your skin's vitality and also aid as a booster for active ingredients. These triple action, anti-free radical agents aid in improving skin texture as well as offering a shield against oxidative stress and pollution. Vitality: Chrono-energizes by boosting cellular respiration, ATP production and epidermis turnover. More: Boosts the skin benefits of other active ingredients. This means that if you further customize your face mask with other actives, vitamins or clays the skin will be prepped to receive their benefits. Our Face Mask has other great ingredients, in addition to the Hydra-M Complex, Kaolin and Castor Seed Oil. The base also contains Rice Bran, Rosemary Leaf Extract, and Sunflower Extracts. You can make it even Better! Our Hydra-M Advanced Mineral Face Mask is a smooth, creamy base that can be customized in countless ways to create any number of unique products simply by adding ingredients like Rose Clay, Bentonite Clay, Green Clay or Sea Clay. You can also use specialty mineral powders such as Black Silt, Sea Kelp Powder and Activated Charcoal, as well as your choice of multiple Botanical Extracts, Vitamins and Oils to create a unique and wonderful mask your customers will love. For full mixing instruction, product use and ingredients click on the Specifications tab above. Aestheticians, with this product you have the ability to create an on-the-spot, customized face mask to meet your client's individual needs. Provides a purifying and balancing effect on sensitive skin by adsorbing impurities and oils. Cooling and tingling sensation, with a refreshing feel after use. A versatile cleanser, moisturizer, and buffer that soothes and protects damaged skin. Full of vitamins, enzymes and antioxidants that moisturize and nourish skin, leaving it smooth and glowing. Kaolin is a natural clay full of nutrients that leave skin moisturized with a light, natural cooling sensation. We chose Kaolin because it is beneficial for most skin types as it does not draw oil from the skin. It naturally stimulates circulation while cleansing and can be used on dry skin without negative effects. In developing this mask we consulted with a number of skin care experts, including registered aestheticians and cosmetic chemists and the majority agree on one thing. A clay face mask should never be allowed to fully dry on your skin. 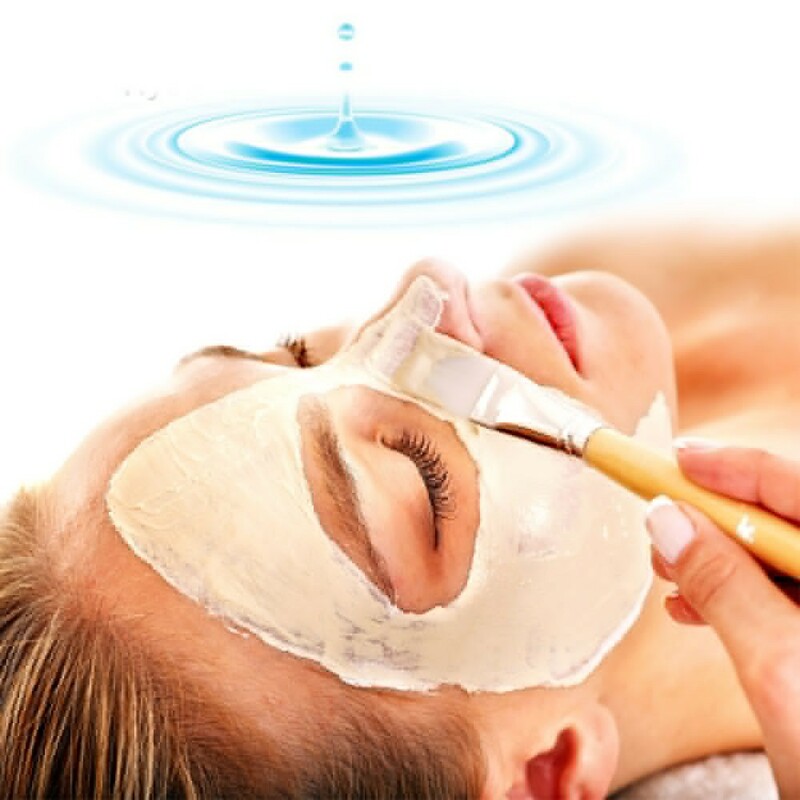 The main benefit of a clay mask is in its first phase, or damp phase, where the nutrients are absorbed by the skin. In the second phase it will cool slightly, stimulating blood flow and prompting your skin to contract. Most masks go wrong by drying too quickly, thus drawing out too much moisture. This drying sensation is often mistaken for a "tightening and lifting effect" but in reality it leaves skin dehydrated, irritated and itchy. Our Hydra-M Advanced Mineral Face Mask is formulated to create the best possible environment for your skin to absorb the beneficial nutrients included without initiating that quick-drying, tightening feeling. Preventing that is one of the benefits of the added Castor Seed Oil. During the final stage of development employees and friends took samples home and tried it. "After trying the mask I felt like my skin responded much better to my moisturizers"
"My face felt totally hydrated and clean, like I just stepped out of a steam room"
Appearance: Only nature can control the color of Kaolin Clay - typically variations of natural off white to dull tan that vary between batches. What should I sell it for? As with any other products this depends on your packaging and marketing savvy. This product is comparable to high end salon quality products which sell for hundreds of dollars per gallon. It all depends on what you add to it and how you market it. On the lower end we have seen products like this sell for $16.00 for an 8oz jar, that's $2.00 an ounce. On the higher end, take a look at products like Skinceuticals. Their similar product is Kaolin based with added Bentonite Clay and it sells for $123.00 for 8 ounces that's $15.00 an ounce. Here you will only pay 0.31 cents an ounce, less when purchased in volume. A definite crowd pleaser. Lavender's soothing smell and effects will work to create the ultimate face mask experience. For those looking to work more utility into a face mask there is plankton extract. It imparts tightening effects which make the skin feel rejuvinated. Often sought out for, charcoal is used for its adsorptive properties. It's effects can yeild fresh, clean feeling skin. This product is so versatile and sells really well. Oh, did I mention it works too? We have been using it 3-4 times a week and my skin feels great! I love that the moisturizing base allows the mask to dry, but not crack. My sensitive skin customers have been able to use this mask too. I highly recommend this product! Best Mask base I've tried!!! I have experimented with many clay masks and additives and this Hydra-M mineral face mask base is by far the BEST mask I've tried and am now adding it to my product line with added ingredients I like to use. I am happy to see your added instructions on the different phases of how a mask works....very important to understand the drying step of a mask. I am a super happy customer! Kaolin clay contains high content of silica that helps in removing the dead skin and makes it to regenerate. This also purifies and detoxes the skin and makes it moist. The oil contains Ricinoleic acid, along with certain of its salts and esters function primarily as skin-conditioning agents, emulsion stabilizers, and surfactants in cosmetics. Cateareth-20 is an emollient and emulsifier, compatible with many oils. C14-C22 is an emolliant that can be a suitable alternative to silicone. Magnesium Aspartate Boosts the oxygenation of the skin. It improves the texture of the skin. Zinc Gluconate is the zinc salt of gluconic acid, and is thought to be an antiviral agent or cosmetic biocide, it can be used in cosmetics and personal care products most frequently as an acne treatment. Copper Gluconate is a copper salt of gluconic acid. It is said to have skin conditioning and protective Properties. Adding Oils: You can easily mix a variety of oils such as Coconut, Jojoba, Avocado, Hemp, Argan and more in to our Hydra-M Advanced Mineral Face Mask. Just add anywhere from 0.1% up to 10%; just remember, the more oil you add the greasier and runnier your mask will become. Adding a standard of 1% oils will minimally affect the consistency while still providing added benefits to the skin. Adding Clays: This base already contains a high percentage of Kaolin Clay but we understand that you may choose to make your product unique by adding more. Add anywhere from 1% up to 20% of additional clays such as Bentonite Clay, Rose Clay, Activated Charcoal or Green Clay; just remember, the more clay you add, the harder and drier your mask will become. Always make a small sample first and make sure you record exact percentages of your additions so you can easily duplicate your formula once you achieve the consistency you like. Adding Extracts: We recommend adding liquid botanical extracts rather than powder to prevent clumping. You can add from 0.1% to 5%, keeping in mind that adding liquid ingredients to the base will ultimately make your final product more liquid. You can find a variety of beneficial liquid botanical extracts on our website under "Raw Ingredients". The possibilities with our Hydra-M Advanced Mineral Face Mask are endless with the addition of a multitude of beneficial additions, so don’t be afraid to experiment with it. Again, when experimenting with different additives and combinations, always work in small sample batches. Should your mask become too liquid, you can add more clay to thicken and dry it out. Alternatively, if you add too much additional clay and your mask becomes too dry, you can add liquid additives and/or oils or extracts to turn it a little more liquid. You can mix the base and the additives in a bowl using a spatula or in a kitchen mixer. Always remember to start on slow speed. Recommended use for labeling: Secure hair to keep out of face. Apply thick layer of Hydra-M Advanced Mineral Face Mask with flat wide brush strokes over face and neck while avoiding eye area. Five minutes is ideal time for it to absorb. Rinse off with warm water. Pat dry.